A man, formerly syphilitic and impregnated with mercury, was deaf on the left ear; it felt as if water roared therein, with tearing pains. A dose of Petroleum for two evenings cured. (Ibid). A man, aet.29, Suffered for a year with frequent pains in the head and teeth, and at the same time hearing diminished. He would hear a clock, only when quite near, but not at all when ten paces away. There is a continuing roaring, bursting and detonation in the ear. There is much thick cerum in the meatus, but on removing it the hearing is not improved; has many small pustules filled with matter on the chest. Belladonna was given without result; Silica 30 alleviated somewhat, but Petroleum 18 effected a perfect cure within five weeks. 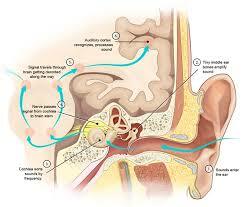 PROVINGS – Deafness (especially after using Nitric acid), cracking in the ears from time to time, singing in the ears. Rushing of wind before the ears, interfering with hearing. In the evening noises before the left ear as if from the rushing of waters; at times there is cracking therein. During eructation something stooped up his ear preventing his hearing promptly. Diminished hearing.